[SBRHS] – The San Bernardino Railroad Historical Society (SBRHS) is pleased to announce Santa Fe 3751 will participate under steam at Metrolink’s Vincent Grade/Acton Station’s second track dedication ceremony on the morning of Wednesday, Sept. 28. During this outing, 3751 will be the first steam locomotive to travel north of Los Angeles in 24 years and the first through Soledad Canyon in 32 years. Preparations for this historic, 120-mile round trip to Acton and return will begin as early as Saturday, Sept. 24, as SBRHS crewmembers ready the locomotive over the course of the next three days. On Tuesday, September 27, the engine will move to Los Angeles Union Station sometime in the mid-afternoon. There, 3751 will join a designated, non-revenue Metrolink consist it will take to Acton. So as not to impact any regularly scheduled Metrolink trains, 3751’s window to depart Union Station will open at 7:30 p.m. before beginning the 60-mile trip to Acton where, upon its arrival, it will then spend the night. 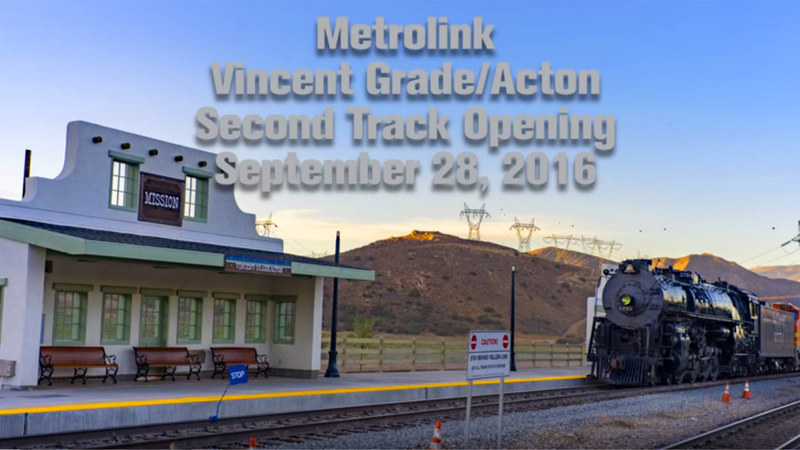 The next morning, Wednesday, September 28, the locomotive will join Metrolink officials and invited guests, taking part in the dedication ceremony of the new, second platform at the Vincent Grade/Acton Metrolink Station that morning. While at the station, there will be no public cab tours and the SBRHS merchandise booth will not be present. At the conclusion of the ceremony, 3751 and its train will depart for Los Angeles tentatively scheduled to follow Metrolink train 216 – pending conditions on the railroad at that time. The locomotive will operate in reverse on the rear of the consist for the return to LAUPT. Noted earlier, this outing will be the first time in 24 years that a steam locomotive will operate north of Los Angeles. The last recorded time any steam locomotive traveled north of Los Angeles was in September of 1992 when Southern Pacific, 4-6-2 No. 2472 pulled the “Earth Train” from San Jose to Los Angeles and return. Breaking away at Burbank for the trip up the now Metrolink Antelope Valley Line (ex-Southern Pacific), a steam locomotive has not traveled this segment of the San Fernando Valley and through Soledad Canyon since 1984 – some 32 years ago. The last recorded time a steam engine traveled here was when Southern Pacific 4-8-4, No. 4449 traveled south with a train bound for the World’s Fair in New Orleans, Louisiana. As with past outings, the SBRHS advises those in the media and fans that wish to stay up-to-date on the locomotive’s whereabouts to follow the updates on the Santa Fe 3751 Facebook page and Instagram account. In conclusion, the SBRHS would like to thank the following organizations and people for their generosity in helping make this trip possible: Metrolink, donations from a small group of BNSF employees through the BNSF Foundation and a donation from members Richard and Kim Casford. We also thank all SBRHS supporters for their continued donations that help keep 3751 operating for outings like this and many more to come. Hahahaaa….I didn’t realize I was in the shot!